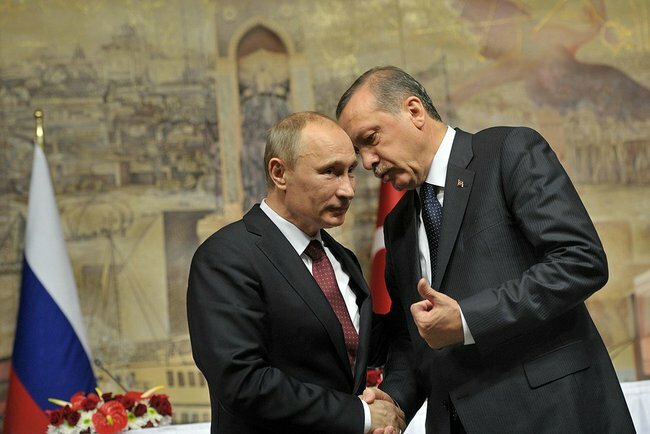 Putin with Erdoğan. After every bilateral crisis over Syria, paradoxically Turkey-Russia relations improve. The recent pattern in Turkey-Russia relations seems to show that any tension between Russia and Turkey, especially over Syria, is paradoxically bringing Turkey closer to Russia. Since October 2017, the Syrian regime, with the help of its allies Russia and Iran, has launched offensives and has been advancing step by step into the regions held by the rebels, including the regions and provinces designated as de-escalation zones by the Astana deal which was brokered in May 2017 and finalised at its 6th round of talks in September in Astana, Kazakh capital, by Russia, Iran and Turkey as guarantor countries. The deal designates Hama, Homs, Latakia, Idlib and Aleppo as de-escalation zones and forbids clashes in these places and these zones are closed for flights by US-led coalition warplanes. However, with the help of its allies, the Syrian regime first carried out an offensive into Hama province and then last week advanced into Idlib province. Idlib was the only rebel-held province designated as a de-escalation zone. Against this backdrop, Turkey, the guarantor country for the Syrian rebels in Astana talks, accused Russia and Iran of breaching the entire peace process. On the other hand, Russia, a couple of weeks ago before Turkey launched its offensive in Afrin, had claimed and accused Turkey for undertaking the recent mysterious attacks including the recent drone attacks on its military bases in Syria. All these developments came in the wake of Turkey’s efforts to forge constructive relations with Russia since June 2016. In June 2016, Turkish President Erdogan officially apologised for shooting the Russian fighter jet interjecting Turkish borders for less than 20 seconds in November 2015. As a response, Russia imposed sanctions on Turkish goods and tourism and this had continued until June 2016. Just a couple of months before the downing of the jet, both leaders were making very positive statements about each other. Erdoğan was appealing to his Russian counterpart Putin to help him to “get rid of” the “burden” (the accession process that was actually a kind of democratization process for Turkey). They were signing new contracts, one of which was for the proposed Turkish Stream, an alternative to the cancelled South Stream project. These were the “fruits” of Turkey’s eastward divergence, or in other words “axis shift.” One big sign of this divergence was the $3.4 billion long-range missile defense system tender which was provisionally awarded to China in 2013. The agreement sparked much concern from Turkey’s Western and NATO allies. However, the growing interdependence seemed to be asymmetric in favour of Russia. This and some preceding incidents show a pattern that after every bilateral crisis over Syria, paradoxically Turkey-Russia relations improve, however, in an asymmetric way in favour of Russia. The recent Afrin operation appears to be of the same nature. Afrin in contrast to other Kurdish cantons in northern Syria was under Russian control before the offensive started. When the US decided to create a border security force from the members of the SDF, Turkey expressed its displeasure and harshly criticised the US and accused them of arming the ‘terrorists.’ Then Turkey benefitted from this context and decided to launch an offensive into the Kurdish dominated Afrin region. Ironically, Russia gave the green lights for this operation. Russia has long seen the Kurds as partners to fight Daesh. However, the recent cooperation between the PYD and the US, and the decision about creating a border security force caused discomfort in Russia. And it appears that Russians decided to punish the Kurds by giving the green light to the Turkish offensive into Afrin. The Russians’ message for the Kurds can be read as follows: ‘if you continue cooperating with the Americans to the expense of my interests I would allow the Turks to hit…’ Now Turkey seems to be determined to extend the offensive into the Manbij area, which is out of Russia’s area of influence and the US appears to be effective there and is determined to remain. Would Turkey face the US in Manbij is the question for which we still don’t have the answer. Russia has been exploiting this asymmetric interdependence and has been punishing Turkey whenever Turkey made a move against Russian interests in the region. When Turkey turns back and makes another move in accordance with Russian interests, this time Russia rewards Turkey but with projects that would further increase Turkey’s dependence on Russia e.g. Turkish Stream and Nuclear energy plants in Mersin and Sinop. Within this context, it might be argued that Russia has been seeking opportunities or has been turning the crisis into an opportunity to break Turkey away from the West, which would bring the containment policy of the West to an end, which is a remnant of the Cold War era politics, and this would be a strong response to NATO’s attempt to enlarge into ex-Soviet regions. Why does Turkey allow the growth of this asymmetric interdependence which gives Russia the upper hand to shape the relations between Moscow and Ankara? Recent state of Turkish politics seems to be preceding over other factors related to Turkey’s economic dependence with reference to energy and natural gas. Turkey’s collapse into authoritarianism in recent years led the country away from its traditional allies, the Western camp. Rise of authoritarian ambitions in Turkish politics motivated President Erdogan to form a new ‘unholy alliance’ with the Kemalist ultranationalists to an extent that Turkish foreign policy and strategies are being guided by the ultranationalists. Therefore, Turkey’s operations in Syria should be read by taking this very factor into consideration. The alliance between Euroasianists and Islamists is an obvious paradox. Because Euroasianism as an intellectual movement re-emerged in 1990s after the collapse of the Soviets as a reaction to the rise of Islamism and Westernism. Euroasianism is a competing front made up of Eurosceptic, anti-American, neo-nationalist, Kemalist, Maoist, and Russophile men and women who represented different segments of the society, from the academia to the military. Their history can be traced back to earlier political bodies in 1930s which manifested Russophilia. However, this is a separate question to discuss in another piece.